Blaise Cendrars was a pioneer of modernist literature. The full range of his poetry—from classical rhymed alexandrines to "cubist" modernism, and from feverish, even visionary, depression to airy good humor—offers a challenge no translator has accepted until now. Here, for the first time in English translation, is the complete poetry of a legendary twentieth-century French writer. Cendrars, born Frederick Louis Sauser in 1887, invented his life as well as his art. His adventures took him to Russia during the revolution of 1905 (where he traveled on the Trans-Siberian Railway), to New York in 1911, to the trenches of World War I (where he lost his right arm), to Brazil in the 1920s, to Hollywood in the 1930s, and back and forth across Europe. With Guillaume Apollinaire and Max Jacob he was a pioneer of modernist literature, working alongside artist friends such as Chagall, Delaunay, Modigliani, and Léger, composers Eric Satie and Darius Milhaud, and filmmaker Abel Gance. The range of Cendrars's poetry—from classical rhymed alexandrines to "cubist" modernism, and from feverish, even visionary, depression to airy good humor—offers a challenge no translator has accepted until now. 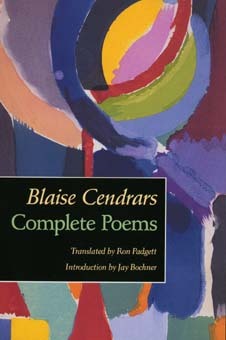 Novelist, poet and essayist, Blaise Cendrars (1887-1961) was also a cineaste, juggler, translator, adventurer. Poet Ron Padgett has also translated works of Apollinaire and Duchamp. Jay Bochner is Professor of English Literature at the University of Montreal.